For some reason I planted 16 basil plants this year and now have more basil then I can keep up with. Go figure. I have been using fresh basil in nearly all of our meals, but that barely puts a dent in the bowls and bowls I have been harvesting every week. Not wanting to waste any of this tasty delight I have been putting it up for later use. 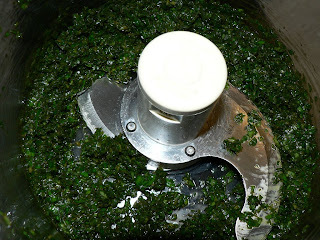 Harvest your basil, remove the leaves from the stems, and rinse clean. I do not worry about drying since I am going to be covering them in water again anyway. Pop the clean leaves into your food processor and give a whirl. You can also chop by hand if you do not have a processor. Once processed to the size you like, drop one or two tablespoons into each compartment of an ice cube tray. 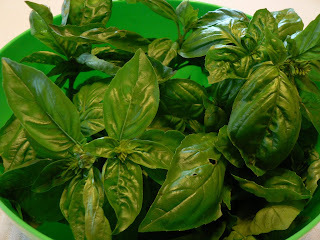 From here you can cover your basil with water or oil. I have tried both. I prefer just using water because most of my cooking starts with butter and I really do not need the added fat. Having said that, this batch was covered with oil. 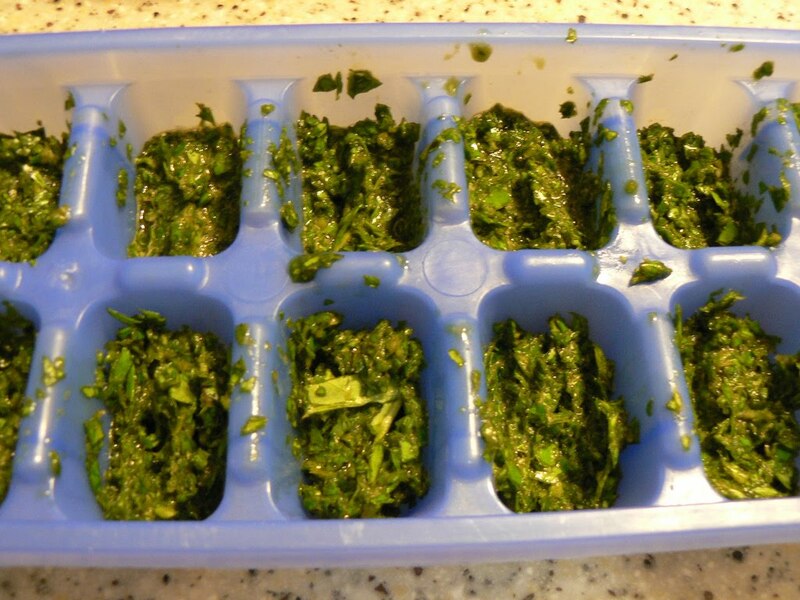 Once frozen solid, pop out your basil cubes and transfer to an air tight storage container. Mine are stashed in glass jars and empty yogurt containers. 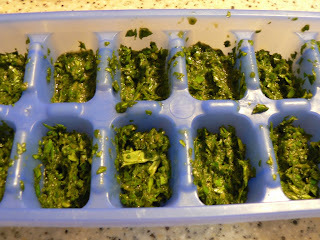 Now whenever you want a taste of summer you can just reach in your freezer, grab a basil cube, and pop it in the pan. Enjoy! 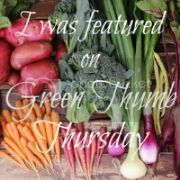 I did the same thing with garlic scapes and ramps this year! Winter is going to taste better than ever! Thanks! My basil is growing like wildfire now, too. This is a great way to save it. Another reason why I need a deep freezer...My freezer is so full right now, it's getting insane. And the funny thing is it's mostly things in canning jars, so it looks like another shelf in my cupboard rather than a freezer. @Sandy This would have been an awesome thing to do with garlic scapes! Mine didn't last long enough to freeze though. Sure wish I had more. @Condo Blues Lisa, I don't squeeze any water out. 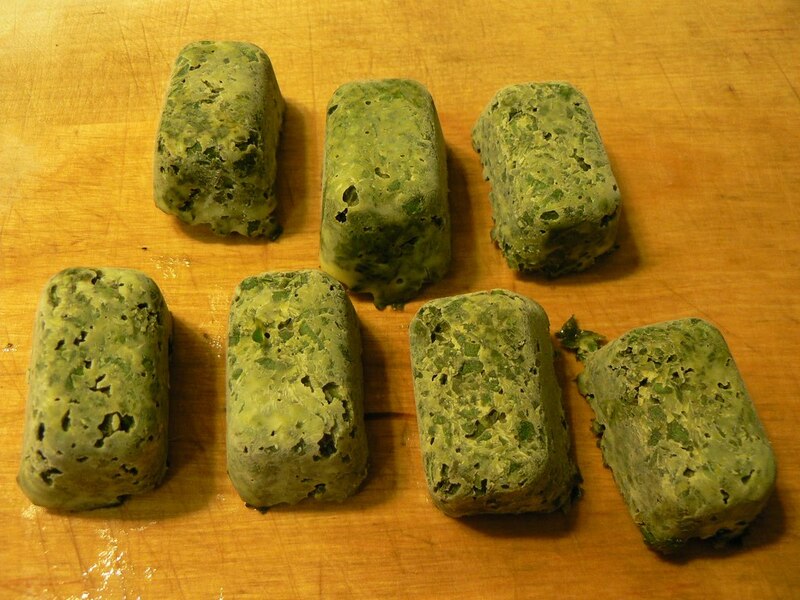 I mostly use my basil cubes in sauces or when steaming or sauteing vegetables in butter, so I just throw the frozen cube in the pot and let the water boil off. 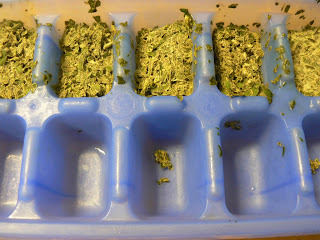 I did freeze some lemon basil leaves whole this year for chilling my lemonade. Yum yum. @Daisy Good luck with your basil! @Conscious Shopper I hear ya on the freezer needs, Erin! We just have a small small chest freezer. It's quickly filling up with things like this. Eventually I will be forced to break out the canner and learn how to use it. I'll have to buy more jars though, cause all mine are in the freezer, too!